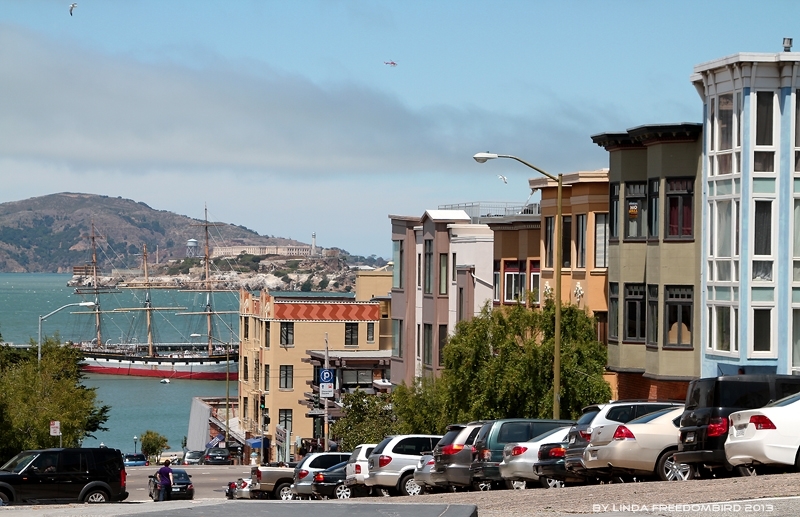 Beside enjoying delicious sea food at Fisherman's Wharf, Farmer's Market at United Nation Plaza ( aka Civic Center) and window shopping at Pier 39, I still managed to visit some of top birding hot spots near San Francisco recommended by a good friend, Jerry Ting! 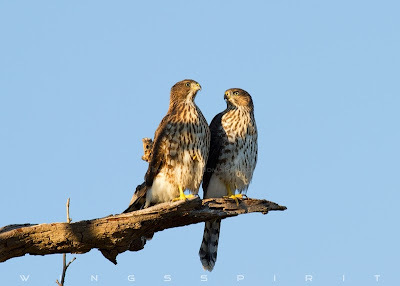 The first image I would like to share with you is a pair Copper's Hawks! I was told by two birders when visiting Coyote Hills Regional Park that I could find Acorn Woodpeckers at Sycamore Grove Park. Since my schedule was pretty tight, I was not sure if I can make to Livermore. When I arrived at Sycamore Grove Park, there was no one single bird! Two huge bulldozers were picking up dirt and drove around the tree where the woodpeckers should be present. I was so disappointed and decided to take mum for a quick lunch and do some Costco shopping. I decided to return after 5 and hoped workers will be gone home by then. I waited under a large half dead Sycamore tree for over an hour and did not see a single soul of any woodpecker. Suddenly I saw three Anna's Hummingbirds, this was a bit of comforting as we don't see Anna's at the east coast. Suddenly, out of jungle, I heard one hawk's calling. Quickly I picked up my gear and walked towards the sound....Overjoyed, there was not one, but two Copper's Hawks perched on top of the tree by each side of park entrance. Most of time, these two hawks were flying back and forth, not sure if they were welcoming me or wanted me to leave. As I kept snapping, they seem friendly and flew very low. Then, they both landed on a single branch! OMG! What a beautiful pair! They communicated with each other by calling and preening. I believe they are juvenile hawks as adult has red eyes :) ...That night I had the sweetest dreams!